Today, the location is Nick's Uptown, but it was once a popular nightclub known as the Cairo Club. This original press photo, available on eBay (search Cairo Club), shows the aftermath of a bomb thrown through the window. In the 50's this was known as the Cafe Beritz and it featured the dynatones a well known Chicago Jazz group. Notice the torn sign for (Marshall) Brodien - (Hypno)tist. That's Wizzo the Wizard from The Bozo Show fame. There was nothing tough about the crowd at the Cairo. My mother was a waitress there, and as a small child I was there often. It was a classy supper club with a shiny dance floor, great food, and linen tablecloths. Brodien was often featured, and Tony Smith headlined a lot. I met many of the Cubs there and a few of the Bears (they dug a small child who knew all their stats). The Beritz was a few doors south, on the corner. I was in there as well; it got rough later on, but not back then. When the Cairo was firebombed, my mom was heartbroken, and so was I. The Anastos family that owned it were great people. At least Tony's still going strong at age 87! My mom worked there too in the 60s, and it was a classy place. All the sports teams of Chicago went there to eat and dance and be entertained by the class acts. 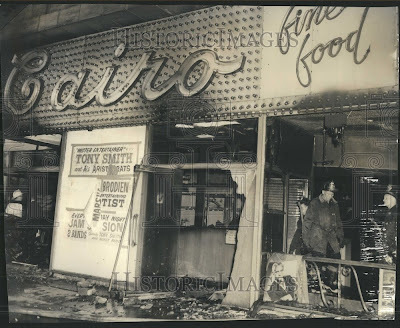 My mom was heartbroken when the supper club was fire bombed.